The prestigious summit, part of the TED network, will take place at the Edinburgh International Conference Centre from 21 to 25 July 2019, bringing together up to 1,300 members of the international TED community. TED is a non-profit organisation devoted to identifying, and then spreading, relevant and potentially impactful ideas. It began in 1984 with a conference converging technology, entertainment and design and over time the organization has expanded its topics from science to business to global issues. TEDSummit gathers the most engaged members of the global TED community for community brainstorms, discussions, performances, workshops, outdoor activities and an eclectic program of mainstage talks - in beautiful surroundings. Edinburgh already has a wealth of experience in hosting and delivering world-class business events as well as being a centre for leading thinkers and innovators. The EICC previously hosted TEDGlobal from 2010-2012 and its believed the benefits of hosting this 'trophy' event next year will go beyond tourism, positioning Edinburgh and Scotland on the world stage. "For a big multi-day TED event we need a very specific type of location", says Bruno Giussani, the Global Curator of TED and coordinator of TEDSummit, who knows Edinburgh well for having curated the previous TEDGlobal events. "It isn't sufficient to just have a beautiful and strong theatre infrastructure - which the EICC provides. We look at the cultural atmosphere of the place, and at all the spaces that we will use - including hotels, restaurants, events and celebration venues and exhibition spaces - as creating a sort of virtual campus that our attendees will be able to experience over several days, moving from one venue to the other by foot, engaging with and immersing themselves in the city". Edinburgh, he added, "offers this atmosphere in spades, and we look forward to bringing the TED community to town." First Minister Nicola Sturgeon said: "With our history, culture and wealth of experience of hosting world leading festivals, Edinburgh is the ideal location for TedSummit 2019. This international event will be an opportunity to show off Scotland as a home of innovation and of creativity and to build on our reputation as a place to visit, to live and to develop new ideas." Malcolm Roughead, Chief of Executive of VisitScotland commented: "Scotland is known throughout the world as a country with a warm welcome, which millions of visitors experience and enjoy every year. We're a nation of pioneers, and a home to ground-breaking scientists, philosophers, engineers and architects for a number of years. 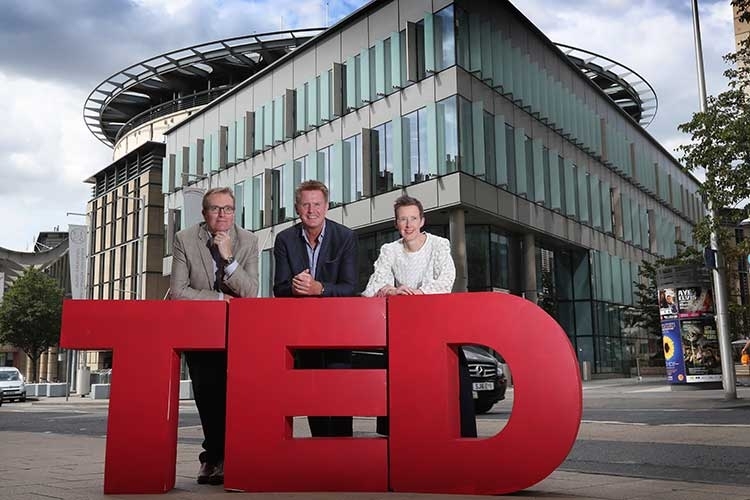 Scotland's innovative past, present and future continue to inspire and influence audiences across the globe, so it seems fitting that we'll be hosting such a prestigious event as the TEDSummit in Edinburgh next year." Marshall Dallas, Chief Executive, EICC: "TEDSummit brings some of world's greatest thinkers and change-makers together once every three years to discuss emerging trends and to share their thoughts and dreams about building a better future for people in every corner of the earth. We are beyond excited to welcome TED to our venue, city and country in 2019. It is hard to think of any one event anywhere on the international scene that captures our own vision statement any better, to create an environment to inspire ideas that change the world." Amanda Ferguson, Head of Business Tourism at Marketing Edinburgh, said: "Edinburgh is renowned for attracting the great minds of the world, encouraging innovative thinking and inspiring debate, so it is entirely fitting that we welcome this unique, global initiative to our capital. This win is a result of close partnership working across Edinburgh, and the impact of hosting the event - both culturally and economically - will be immense. We at Marketing Edinburgh could not be happier to host TEDSummit in our city and look forward to a lively, engaging and enjoyable event." Jane Martin, Managing Director, Scottish Enterprise: "This win for Scotland demonstrates the power of partnership working and being ambitious about what we can achieve together. With the world's thinkers and innovators coming together here next year, we have a real opportunity to put Scotland firmly on the map as a place that embraces progressive ideas and is a great place to visit, to work, to live and to invest for the future."